Here is a closer look of the textured paper. I suggest you use a heavier cardstock, since the results aren`t as good with thin papers. Here are two sandwich instructions for Cuttlebug, but you can figure it out for other machines pretty easily with few tries. Sandwich without the embossing mats: plate A, plate C, burlap, cardstock, plate B. You might try it few times to find the right solution for you, since even the same machines are slightly different and the thickness of burlap and paper differ. Just be careful not to brake your machine. And the finished card with the textured panel. I used the Floral Framelits set for the flower and vines, but I cut off the stems. Hello friends! Stephanie here. For my post today I was going to share some winter cards, but that doesn’t quite feel right because it’s been feeling a more like spring than winter here in my neck of the woods! So instead, I’ve made a winter card and a spring card! For my winter card, I started out with the Snow Dots background stamp. I heat embossed the background onto white cardstock and inked it up with various colors of blue/green distress inks. The snowflakes are from the Christmas Reindeer set, but they are punched out slightly smaller than the actual stamp. With this Snow Dots background stamp, I couldn’t help but only think of snow and winter, but I got to thinking… why does it HAVE to be snow?? So for the next card, I stamped the background in neon pink, and then stamped it again offset with Tide Pool Shadow Ink. 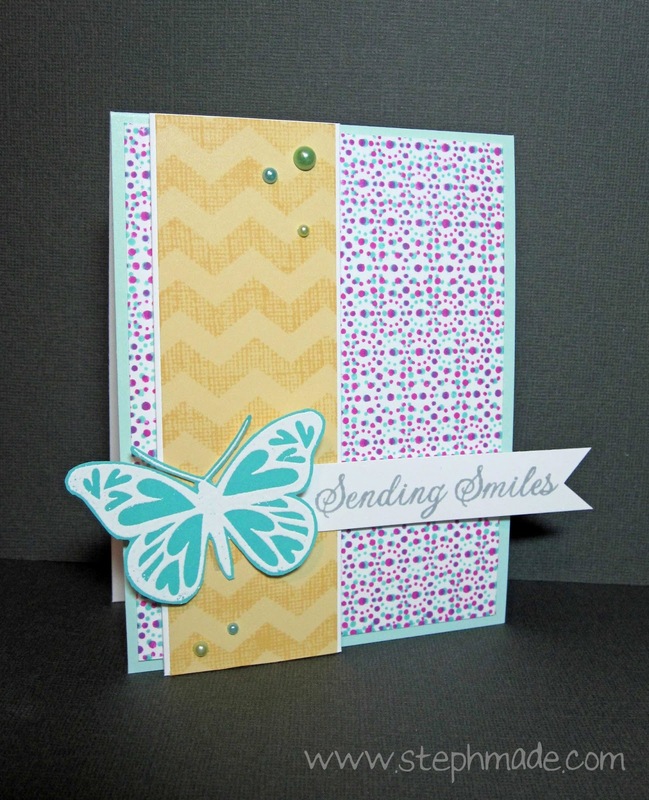 For the rest of the card I used more spring-like colors and added the heart winged butterfly, which is stamped and heat embossed onto pool cardstock. Isn’t it neat how you can change the entire feel of a card just by changing the colors? You could use this background stamp with many other color combinations to create different feels. You could use red, pink and aqua to create a Valentines card. You could use browns, yellows and oranges for a fall themed card. Or for a festive 4th of July card you could use red white and blue… those dots could easily look like fireworks!! Thanks so much for stopping by today. Have a fantastic weekend!! Let’s prepare for Valentine’s Day! Hello fellow crafters! I hope 2013 is treating you well and that you all are happy and ready to stamp! I decided to start early on my Valentines this year. And also in keeping with this year first challenge, I wanted to try something new. What is that, you wander? I needed some flowers for my cards and I found a perfect flower stamp from Hero Arts which petals are shaped as hearts, the only problem was that since I wanted to paper piece them I needed an outline stamp, but it is a solid one, so I decided to stamp on the back of the papers I wanted to use, and then fuzzy cut them. I have never thought of doing this before, but I think it opens our stamps possibilities even more! I wish you all a year filled with creativity and love! Speaking of new, it just so happens to be our current challenge. I absolutely love combining my new stamps and my old stamps. Sometimes you can create the cutest combos, plus you make sure your still using those old favorites too! Since I have baby on the brain (sometimes I think this baby is taking over my brain!) I decided to create two baby cards using the same products but with different looks. For the first one I paper pieced my elephant (this is my old, it’s only 4 years but I think stamps age like dogs. Or at least that’s what I tell my husband so I can keep buying them. ha!) I cut a thin strip of pink to ground him and a thin strip of dark gray to create my flag pole. I stamped the banner (my new from Hey Day Sentiments) in bubble gum mid-tone ink and trimmed it so I could create the look I wanted. I rounded two corners to finish it off. Thanks for joining me today. Now go love your new stamps and your old ones too! 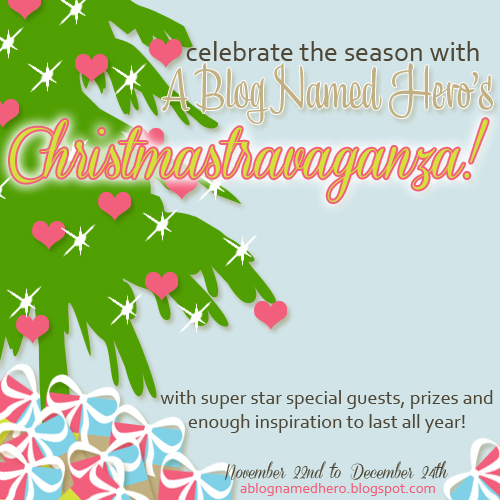 We’re here this time to announce the lucky winners of the Christmas-travaganza prizes!! First of all a HUGE thank you to the amazing ladies who participated and showed us SUCH amazing, inspirational projects. A big thank you for your time and also your genius! YES! That’s 20 winners! CONGRATULATIONS! The winner of the Celtic Candle thanks to Cris is: Kailash! If we have not heard by all of these winners by January 15th, we will re-draw any prizes that have been unclaimed. Thank you so much for your enthusiasm about our Christmas-travaganza, it was a beast of an event and it was fantastic from start to finish! We hope it provided you with more than enough inspiration to help you through the holidays!